Nahua people had a special way of thinking and speaking. They considered that two ideas which belonged together could express a whole concept. Why a skirt and a blouse? Because these were two important garments that every woman wore in Mexico before the arrival of the Spaniards. 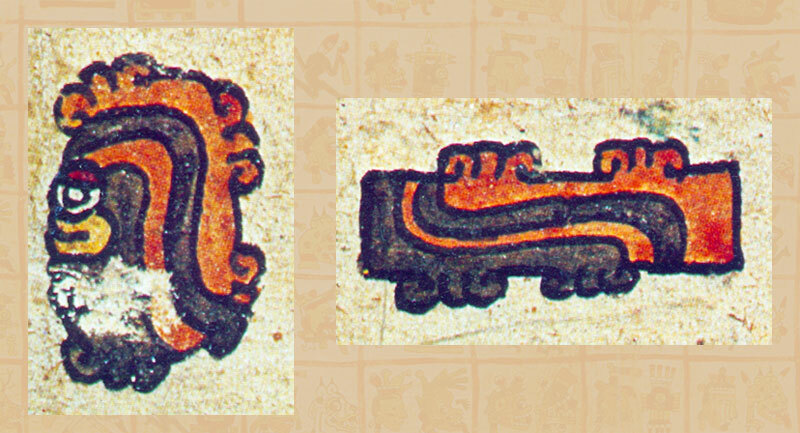 In Picture 1 there is an image that comes from a codex (the books of the Nahua [Aztec] people) and you can see a woman wearing a skirt and a blouse. These two words used to name important things are called diphrases but they are also known as couplets, pairs, or binomials. The diphrase represents weaving, one of the most important activities of women in prehispanic Mexico. Girls were taught to weave from an early age and it was an important duty for every woman. So a diphrase is composed of two attributes (or even more) that identify important things like a woman, a warrior, a city. The features that compose a diphrase are not random. They are closely related to the way Nahua people perceived and conceived important persons and things. the eagle, the jaguar = warrior (Picture 2). In pre-Hispanic Mexico, war was a very important activity and warriors were much respected. There were two military divisions: the Eagles and the Jaguars, daytime and night-time animals respectively. 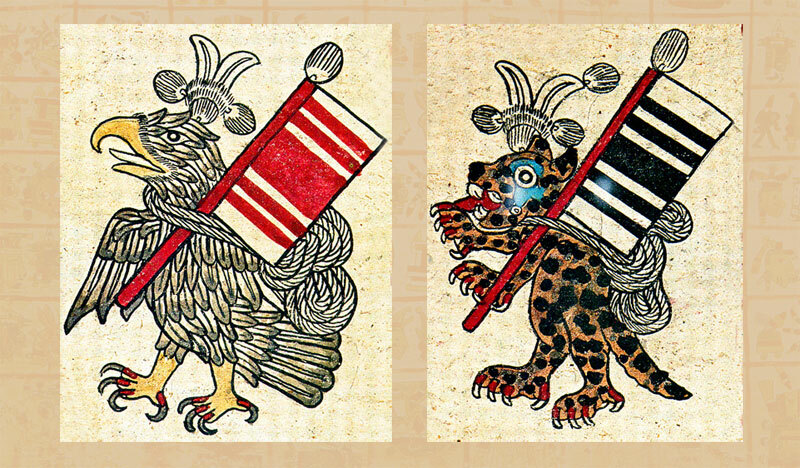 Eagles and jaguars are strong and powerful animals in their own ecosystems, so characteristics of both animals were used to identify warriors. the arrow, the shield = war (Picture 3). This is also another diphrase for war but this time it focuses on arrows and shields, which were the main weapons used by warriors in battle . water, mountain = the city (Picture 4). Water was one of the most important elements needed to maintain a city. Pre-Hispanic people thought that water originated in the mountains that were also considered as big places of storage where water was kept. cypress tree, silk cotton tree = protection (Picture 5). This diphrase expresses protection; this function could be carried out by different people like parents, rulers, priests. These trees have characteristics like strength and lots of foliage that give shelter from sun and rain and in this way they stand for people who were capable of giving security and protection. coffer, reed basket = secret (Picture 6). In toptli refers to the idol that was kept in the coffer and which was used in some rituals, it was kept out of sight. Both containers were used to hold valuable things that were kept out of sight, hidden and secret. night, day = an entire day (i.e. 24 hours) (Picture 7). 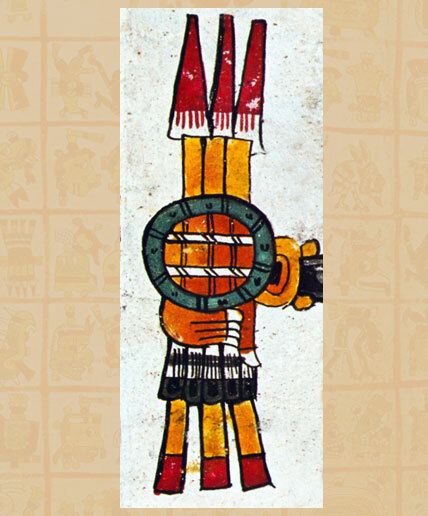 This diphrase is found in other Mesoamerican languages and it means the complete solar cycle. 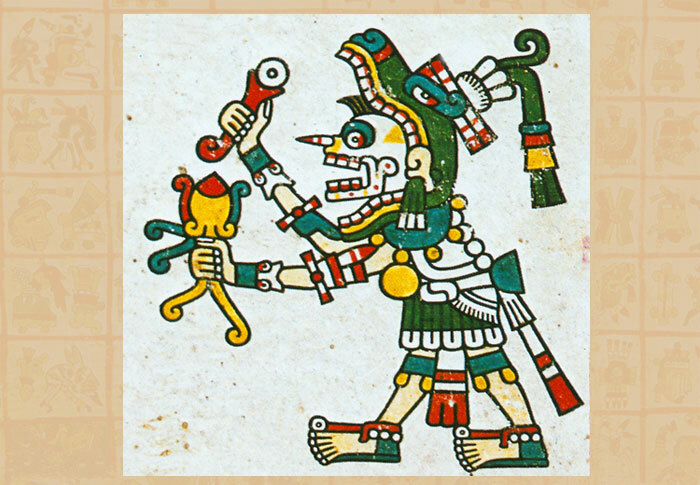 Day and night were important concepts for the Aztecs because they meant the renewal of life, so they developed two calendars, one for day-to-day and another for the ritual cycle. eye/face, heart = the person (Picture 8). This diphrase refers to the person, the human being. The sense is made by combining two essential ideas: vitality and emotion (yol) and perception (ix). The eye/face is the most prominent external region of a human being and the heart is one of the most important internal organs that relates to movement, living and emotions. stone, stick = punishment, both physical and moral (Picture 9). Several types of punishment existed for serious wrongdoing, one of them by means of throwing stones and hitting people with sticks. But there was having icy cold water thrown over you or having to breathe in chilli smoke. the black, the red = codices, wisdom (Picture 10). Black and red were important colours because they were the basic colours in which codices were painted. 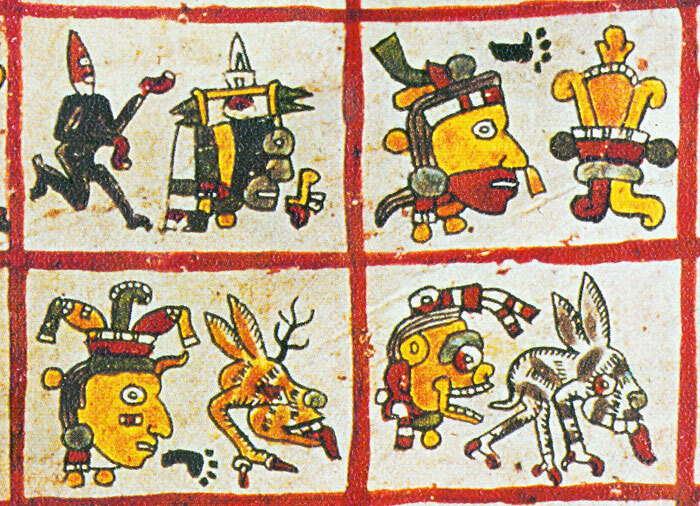 Codex drawing was a task done only by specialised officers known as tlahcuilohque. So this diphrase refers to pre-Hispanic books. The couplet in tlilli in tlapalli has an additional meaning that refers to wisdom; books are a way of preserving knowledge. 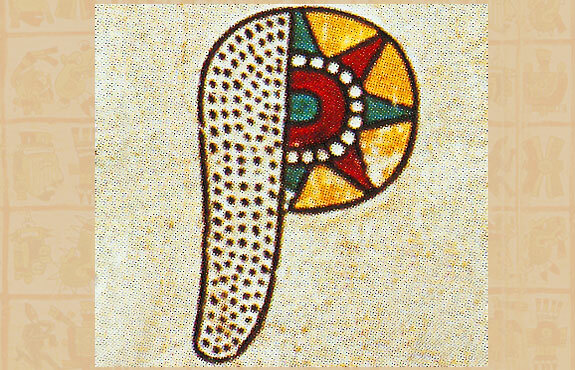 Why did pre-Hispanic people use this particular way of expression? Because they wanted to give certain things honoured status; in other words, to consider them with respect because they were special. And since this way of naming ideas was distinctive not everything had a couplet name made up of two nouns together. 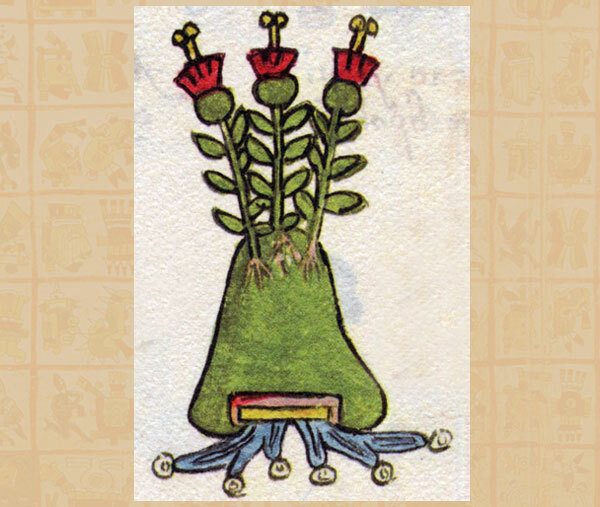 Other codex images scanned from our copies of respective facsimiles published by ADEVA, Graz, Austria.